With this mini Bluetooth device controlling your color changing RGB LED lights from your smart phone or tablet has never been easier (ioS or Android). The IP68 waterproof rated controller can be used with any 6-24VDC constant voltage RGB LED lights. 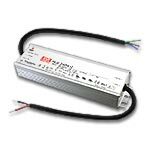 An output of 4 amps x 3 channels allows for 144W of power at 12VDC or 288W at 24VDC. The free and easy to use 'ColorEasy3 Plus' application lets the user choose from over 16 million color choices and 42 color changing modes with 99 levels of speed adjustment. There are 16 storage spaces to save your favorite custom colors and 16 storage spaces for quick access to your favorite color changing modes. The Bluetooth control range from controller to smartphone or tablet is approximately 100ft with no walls or interference. 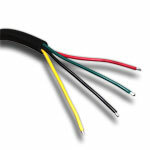 The small size and simple 18AWG bare connection wires are perfect for any new or existing indoor/outdoor LED lighting application. This product is IP68 waterproof rated but not designed to be submersed in water or directly exposed to any outdoor elements. Please note: Only one Bluetooth Controller can be connected and operated in a single area, multiple Bluetooth Controllers will not pair or sync. This Mini Waterproof RGB LED Signal Amplifier is IP68 rated and can be used to extend the control signal on any outdoor or indoor LED lighting project using 5-24VDC constant voltage RGB LEDs. When you have exceeded the maximum load of your RGB LED controller use this signal amplifier to provide the same control signal to another 12A (4A x 3CH) of RGB LED strip lights, modules, or fixtures. By adding this RGB Amplifier and another power supply you can add up to 144W of RGB Lighting at 12VDC or 288W at 24VDC to your existing RGB lights. 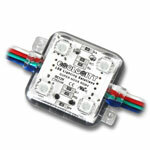 For use with 4 pin, 3 loop, common anode style RGB Lighting. Simple bare wire connections make installation a breeze on any new or existing project. The waterproof rating is not designed to be submersed, or meant to be exposed directly to outdoor elements. Our rugged, dependable, flexible and waterproof Ribbon Star RGB 180 LED Strip Light has super bright 3 in 1 RGB SMD LEDs on board and can produce 16 million shades of brilliant color. 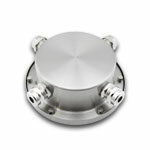 The heavy duty IP67 encapsulated silicon housing is outdoor rated, waterproof (non-submersible) dust and UV proof. There are 3 LEDs every 2 inches. This 118" (3m) roll is excellent when you need a commercial grade, color changing indoor or outdoor RGB light strip. Comes with 3M™ VHB™ mounting tape on the back, for the best long-term mounting solution. 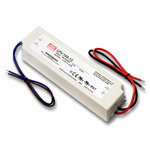 43W of constant voltage 12VDC power needed for this 118" strip (4.3W per foot). This RBG LED light ribbon can be used for outdoor architectural, landscape, accents, pathway, entertainment lighting, bars, casino lights, full color cove lights, RGB backlighting and in theater sets. Each roll includes 10 clear plastic screw down holders, 4 closed end caps, 4 end caps with holes for wiring, and a waterproof connector at each end. See link below for demonstration video. This LED Strip is UL Listed for class 2 circuits, RoHS and CE approved.